Home › Transgender, Transsexual, Trans › Discrimination, Equality, Civil Rights › GOP governor on NC-style Bathroom Bill: “Why? Why would we? Why would anybody need it? Is it an issue? GOP governor on NC-style Bathroom Bill: “Why? Why would we? Why would anybody need it? Is it an issue? “Is there anyone you know in Kentucky who has trouble going to the bathroom? Seriously. Have you heard of one person in Kentucky having trouble taking care of business in Kentucky? . 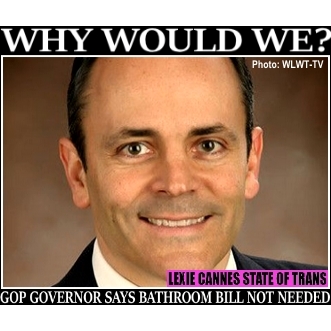 . .
Bevin made the statement even though a number of Republican state legislators ran for office heavily supporting a trans bathroom ban. Incoming Republican legislature leaders say the plan to look at in the next session. Gov. Bevins has done a complete about-face since earlier this year when he joined nearly a dozen other states in a lawsuit to stop the federal government from issuing trans equality rulings for bathroom access. Clearly Gov. Bevins learned from North Carolina’s Gov. Pat McCrory train-wrecked political career — a gamble that didn’t pay dividends even though Trump carried the state. Our investment in seeing McCrory defeated is paying off one heck of a dividend elsewhere, even in age of Trump — a man who has actually said trans people ought to pee where they want. We’ll see. What is needed is harsh punishment for actual perverts and molesters, not attacks on the transgender population.